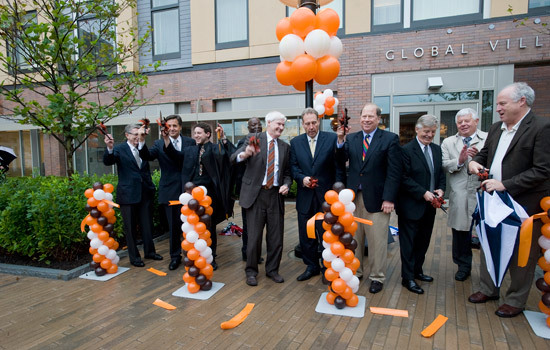 RIT President Bill Destler (center) and other dignitaries at the Sept. 30 ribbon cutting and grand opening celebration for Global Village. Despite less-than-cooperative weather conditions, Rochester Institute of Technology celebrated the grand opening of Global Village in style, complete with a steel-band performance, food tasting and tours of the international-themed complex. The festivities took place under rainy skies today at the location situated between Crossroads and the Center for Student Innovation. Supporting the global and entrepreneurial missions of RIT, Global Village provides resources that prepare students to enter the global community and culturally diverse workforce including educational programming, unique activities and an international living environment representing regions from around the world—East Asia, the Middle East, Central Europe and Central America. The project takes the shape of a European courtyard complete with an international market, Mexican cantina and fresh sushi bar. Global Village’s 414-bed student residences feel more like an upper-Manhattan hotel with décor reminiscent of regions from around the world and provide upper-class students with a state-of-the-art global living experience. Other unique aspects of the complex include heated outdoor seating, a beach volleyball court, water feature, outdoor fire pit and ice-skating rink and a performance area with a stage. The Global Village courtyard also includes 28,000 square feet of heated pavement to increase usability in winter. In addition to new dining options, the complex features a hair salon, post office, wellness center, art gallery, and a soon-to-be-added sports outfitter. Due to the global nature of the project, RIT’s Study Abroad and Fellowships office has relocated to Global Village, along with Global Initiatives and Programs, Native American Future Stewards Program and the Entrepreneurial Center. Greg Pollock, RIT Student Government president, echoed that sentiment. A fourth-year professional technical communication student, Pollock has studied abroad three times throughout his college career. Howard Ward, assistant vice president for student auxiliary services at RIT, reminisced about conversations related to creating new housing with a “wow factor” for the campus community. Other speakers at the grand opening event included James Watters, RIT senior vice president for finance and administration; Donald Boyce, chairman of RIT’s Board of Trustees; and Michael Yudelson, Henrietta town supervisor. Contractors: ARC/Architectural Resources Cambridge, architectural, planning and interior design firm specializing in educational, science, sports and corporate facilities, and SWA Group, specializing in landscape architecture, urban design and planning.